Join our ninth Twitter chat on September 27 at 9/8c! Hosted by Lauren Appelbaum and Cara Liebowitz of RespectAbility, this Twitter chat will take a look at ideas explored in Born This Way by the young adults with Down syndrome and their parents. Following this chat, join us in live tweeting each episode of the second season, airing on A&E at 10/9c. In the season two finale, Megan learns the hard way that taking care of a baby is not anything like she imagined it would be, Rachel finds romance on the road to fitness and Steven finally faces up to his feelings about Megan. Join our eighth Twitter chat on September 20 at 9/8c! During tonight’s #BTWchat, we take a look at achieving dreams! The first part focuses on Cristina’s dance competition & John’s new rap star successes. The second part focuses on Megan’s love life triangle with Brendan and Steven. Join our seventh Twitter chat on September 13 at 9/8c! 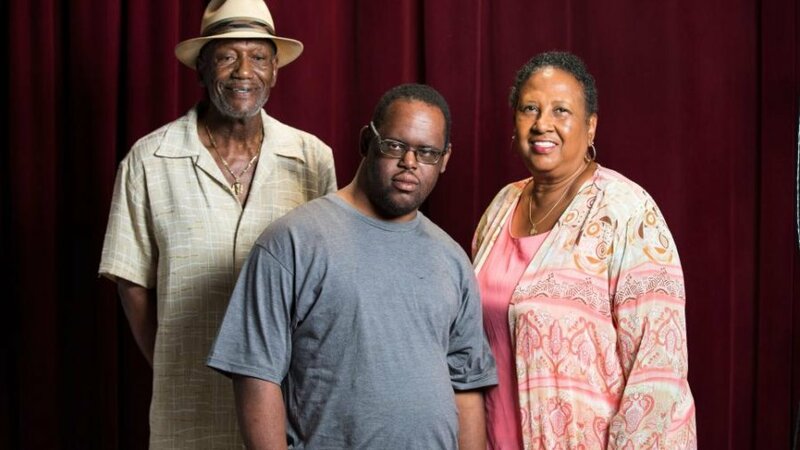 Washington, Sept. 12 – For the first time in history, a TV show staring people with disabilities has won an Emmy Award – and one of the stars, John, is African American! The glass ceiling-breaking show is Born This Way, A&E Network’s critically-acclaimed and award-winning original docuseries, which airs Tuesday nights at 10/9c. Beating out five other series including previous winners Deadliest Catch and Intervention, Born This Way won the Emmy for Outstanding Unstructured Reality Series at the Creative Arts Emmy Celebration Sunday evening. The show documents real life as John continues to pursue his dream of becoming a rap artist and entertainer, but has a lot of life skills to master before he is ready to live on his own. BREAKING NEWS! Glass Ceiling Broken at Emmy Awards! Washington, Sept. 11 – For the first time ever, a series starring a cast with disabilities has won an Emmy Award. Born This Way, which is in its second season on A&E, won for Outstanding Unstructured Reality Series beating out five other series including previous winners Deadliest Catch and Intervention. In addition, two episodes from Born This Way were nominated for Outstanding Picture Editing for an Unstructured Reality Program but lost out to HBO’s Project Greenlight. 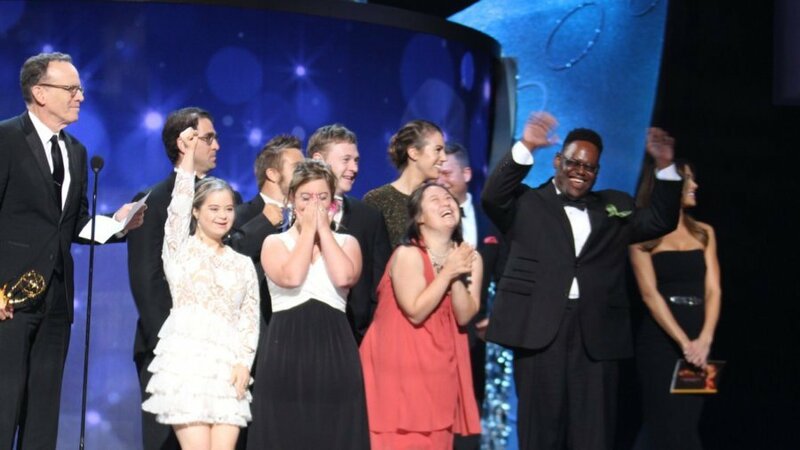 A&E Network’s critically acclaimed and award-winning original docuseries Born This Way’s honors keep adding up – showing that disability is a winning theme. Join our sixth Twitter chat on September 6 at 9/8c! The first half of tonight’s #BTWchat deals with Rachel’s struggle with weight issues and pre-diabetes. The second half of tonight’s #BTWchat is about Megan’s first day of work at @BestBuddies! Join our fifth Twitter chat on August 30 on relationships at 9/8c! 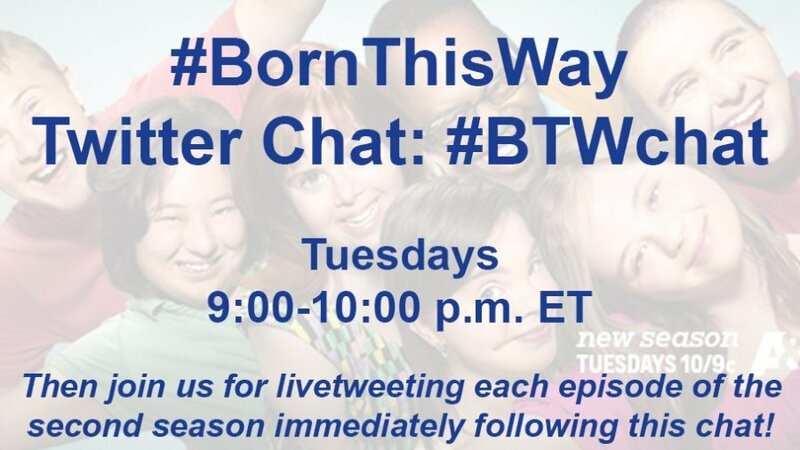 Tonight’s #BornThisWay episode includes relationship issues that people of all abilities face, so that’s our focus for this #BTWchat!